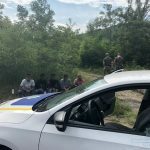 In the coure of preventive operation “Migrant” the illegal migrants were apprehended by the representatives of the Department for Counteraction to Crimes associated with human trafficking together with the policemen of the Uzhhorod response units of Mukchevo Border Detachment and staff of the Migration Service nearby the village of Hluboke in the wood line. Five foreigners (21 to 50 years old) had no any documents. In addition, there was 35-year-old Ukrainian citizen in the car, who had been living in Ukraine for a long time. He is suspected in organization of illegal transportation. Police initated the criminal proceeding as to the fact of the offence. It is planned to transport them to Mukachevo Border Detachment. The investigation goes on. This entry was posted in Translated Media-News from Ukraine and tagged Border Detachment, migrant, Mukachevo, Ukraine on July 27, 2018 by oksana.